My Black-eyed Susan vine is still growing and blooming. She’s grown as an annual here and will bloom until our first frost, usually in November. I planted some pumpkins around her to keep her company for a little seasonal display around my Potting Shed. I planted her on an obelisk in a pot to climb back in May. She made her way over to trail along my bench. . .
And then grew over to climb up my bicycle built for planting. She’s a vigorous grower and overachiever. . .don’t you like that in a plant? My watering can collection seems to be a vigorously growing too. 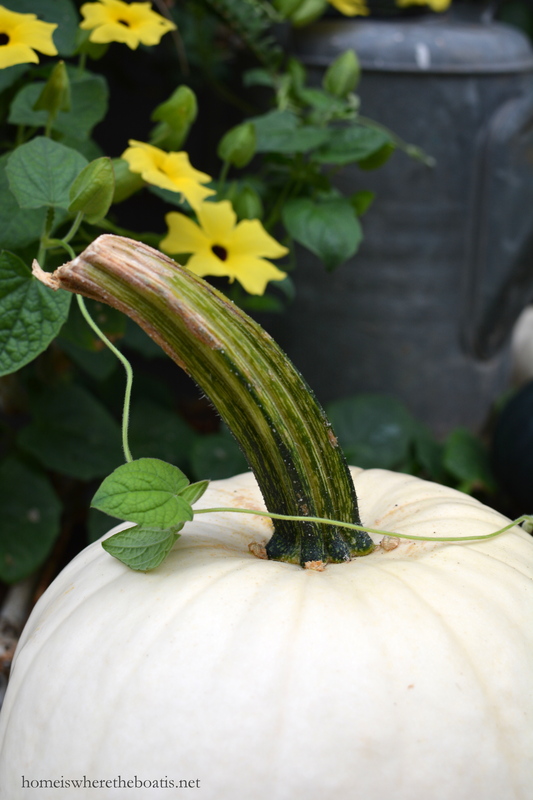 . .
And I find myself coming home with a pumpkin or two every time I make a trip to the garden center or farmers market. 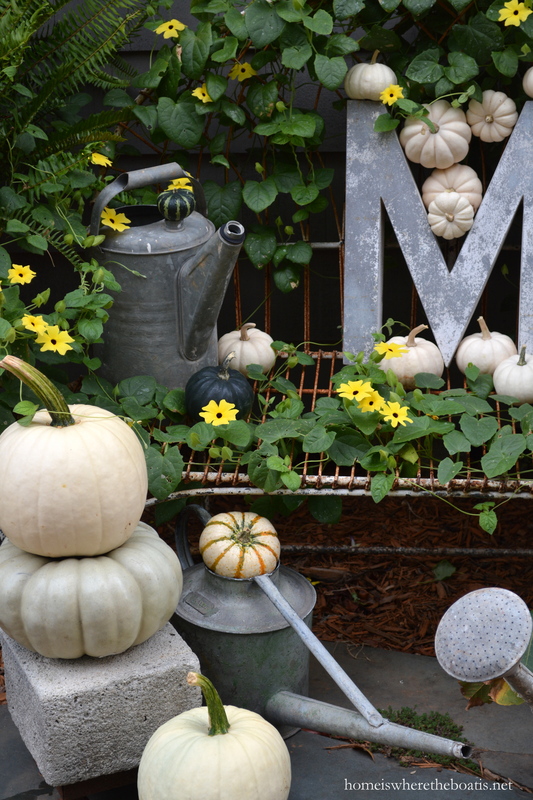 . .
Hope you’re enjoying some blooms and pumpkins where you are! Wow Mary, your Black-eyed Susan vine is so prolific!! Maybe she got weary from her vigorous growing, then needed a rest on your bench. After her revival, she then was ready for a stroll on the bike. She’s just like us…rest and relaxation leads to vitality. I hope you plant her next year, as she’s a beauty. I’m enjoying your addiction of pumpkin and watering can collections. Happy weekend to you! Hello, my name is Linda and I’m also a pumpkinholic! Great pics. 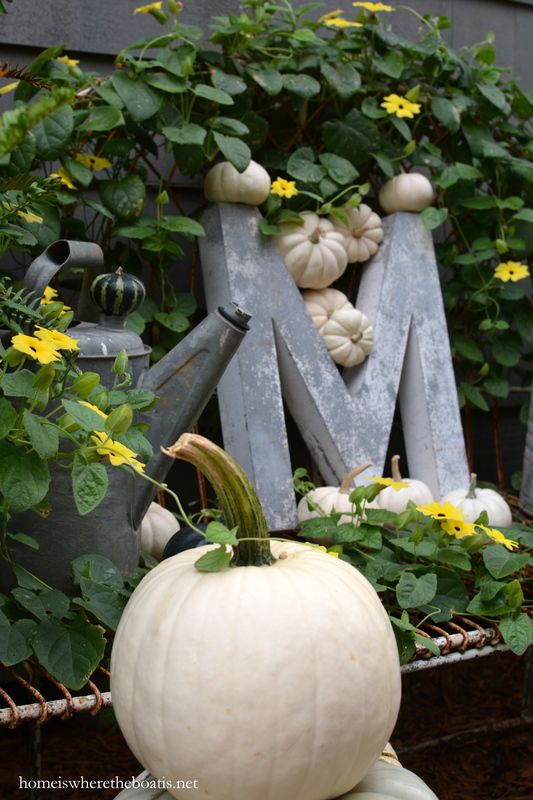 Mary….love the pics of your vine with the white pumpkins. I planted a Black-Eyed Susan Vine this year around one of my bird feeders and it has gone absolutely crazy. I planted a white one that didn’t do as well. I love the way yours vined its way around your bench. Always look forward to your posts! Happy Friday! I am somewhat of a pumpkin addict myself Mary :) now if I could only grow something besides weeds and moss! 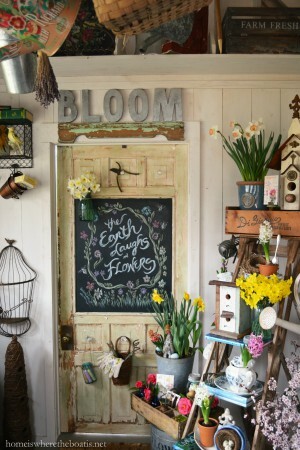 I think plants and flowers just seek you out and can’t wait to bloom all over your potting shed! 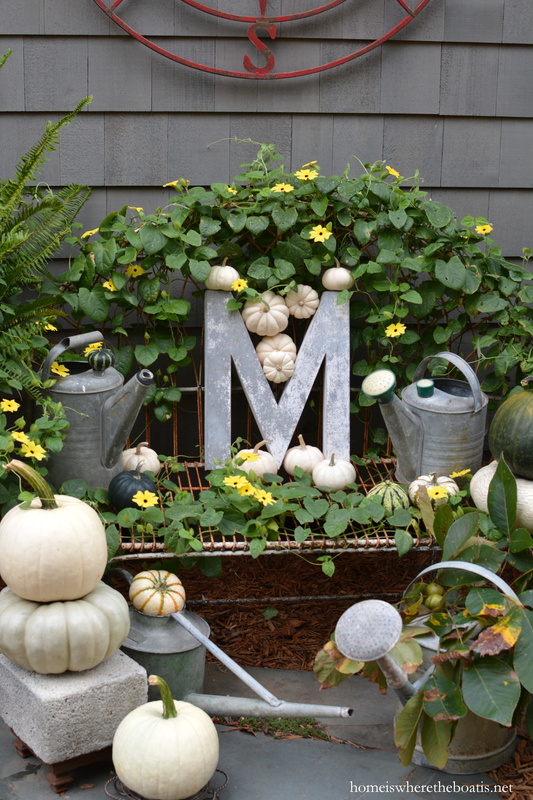 Your M looks so happy covered with pumpkins and vines~ happy weekend! Great post, Mary! A few weeks ago you featured the area of Blowing Rock, an area I had never heard of, but loved the gardens & sculptures you featured, so now we are here in a different season. Thanks for sharing! Love love love it, it’s been a long time since I grew this vine, takes me back to such sweet memories… adore the white, silver and yellow combos, every pic pure delight! Oh how very lovely Mary….I have to put that Black Eyed Susan vine on my list!…off to the garden center today, so will be inquiring about it….Love how you use your watering cans like a rain chain. 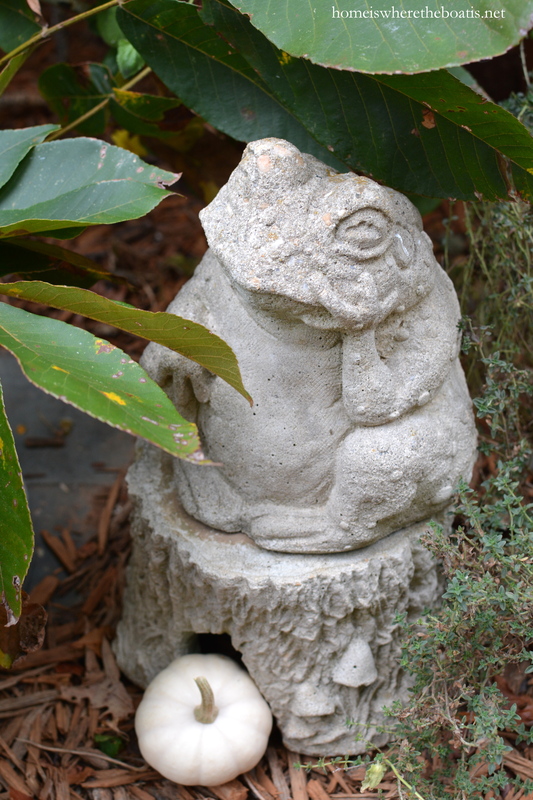 And must say that I love your “The Thinker” frog!!! Have a great weekend! Thanks for this post. I didn’t know a BES vine existed! Your watering can collection is amazing, I love them too. Good morning, Mary! Just yesterday I was going to a friends and saw 2 fabulous, vintage watering cans on someone’s front porch. I am SO tempted to go ask if she would like to sell them! Your collection is amazing. Love how you have them hanging. 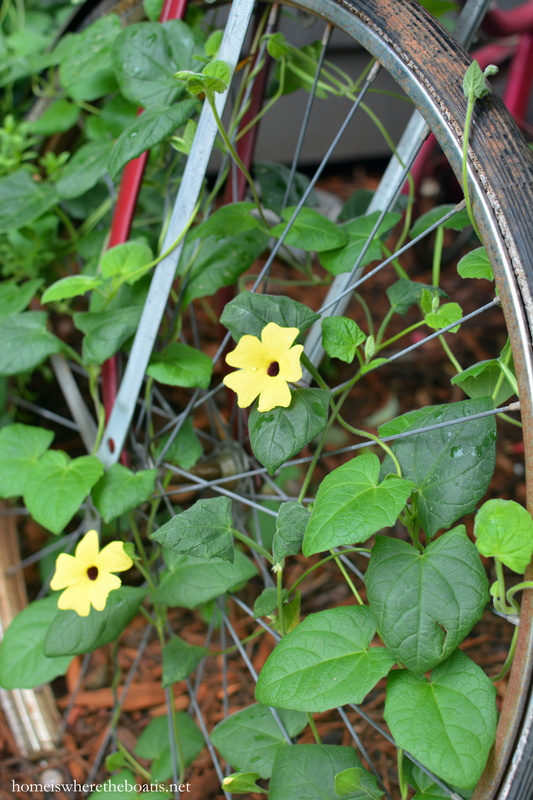 I never knew there was a black eyed susan vine! I will have to see if I can get one next Spring! Have a beautiful weekend!!! 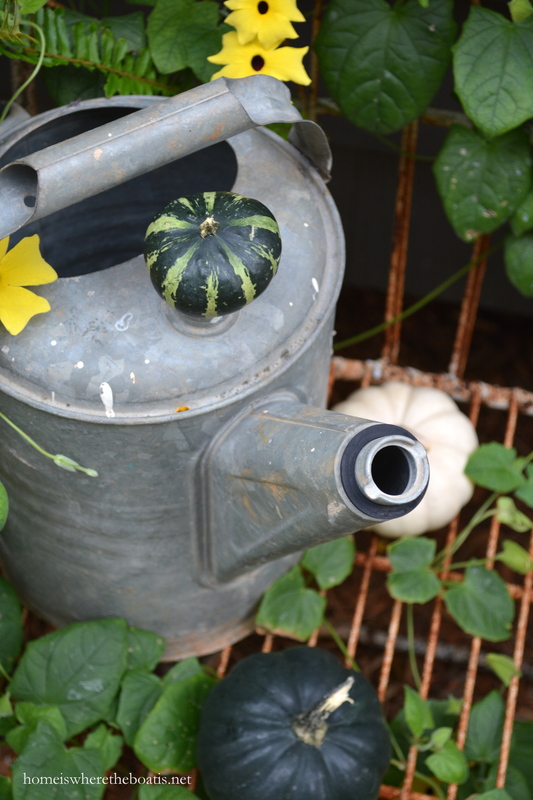 I chuckled out loud when I read, “need to enroll in Pumpkin and Watering Can Anonymous”! 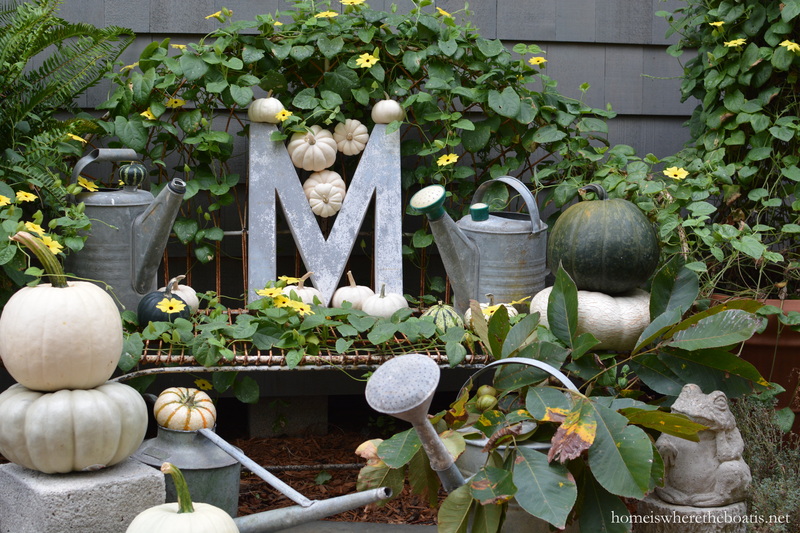 Love this post, especially the Black Eyed Susan vine and chain of vintage watering cans!! As always………so charming and lovely!! 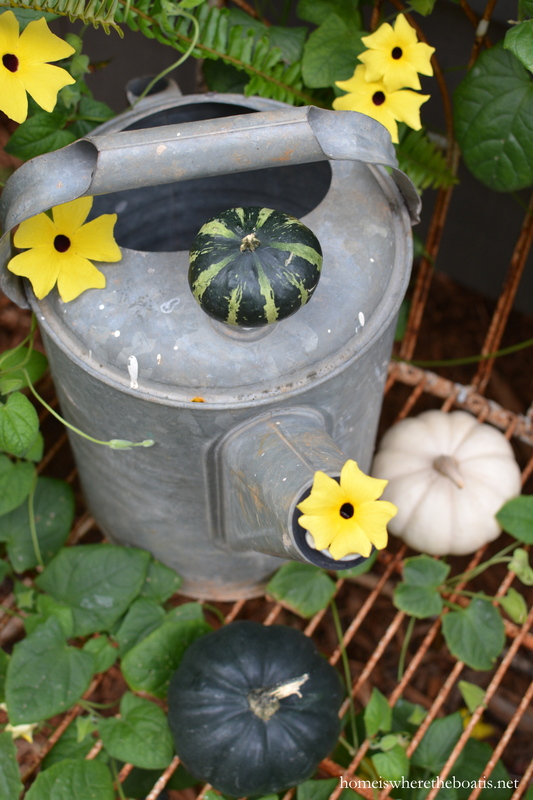 Love your black-eyed Susan vine and watering can collection. I’ve never seen white pumpkins before. 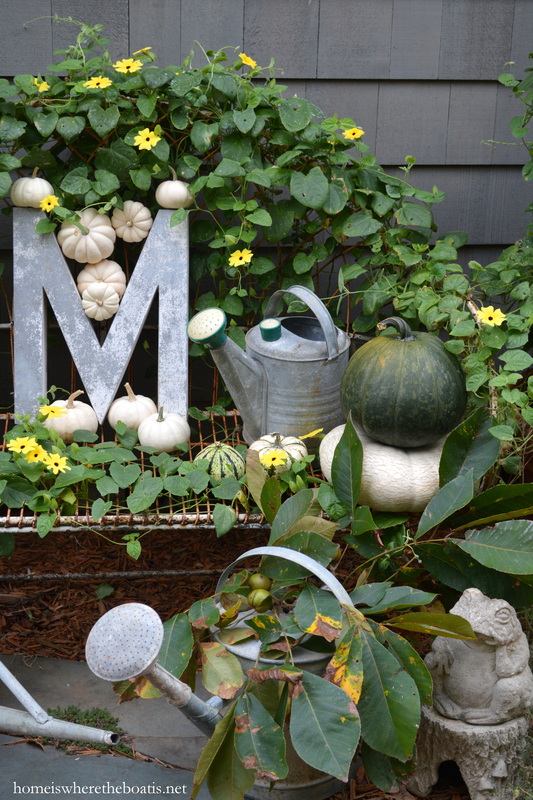 It is a wonderful fall display by your potting shed. A feast for the eyes! I live in drought stricken Southern California where there isn’t enough water to let anything lush grow. People are increasing replacing lawns with gravel. Your pictures are gorgeous and soothing to my soul. Keep sending them they are like an oasis. LOVELY! Feels like Autumn! 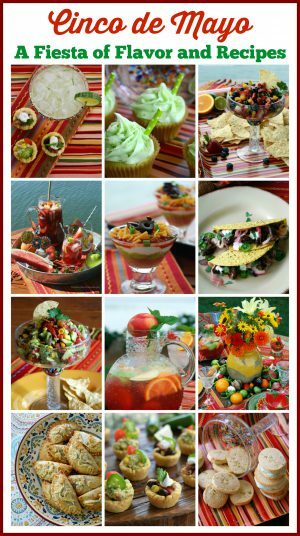 Thank you for sharing your beautiful creations and amazing photography! Such FUN Fall decorations! I really LOVE it! :-) Happy Sweet Fall Season! White pumpkins in Tuscaloosa are almost non- existent. I did find one at Fresh Market. 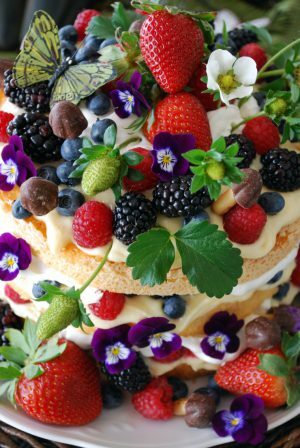 I love the floral arrangement that you did and want to create it. By the way, my pumpkin has a stem. I have enough blooms to make an arrangement. 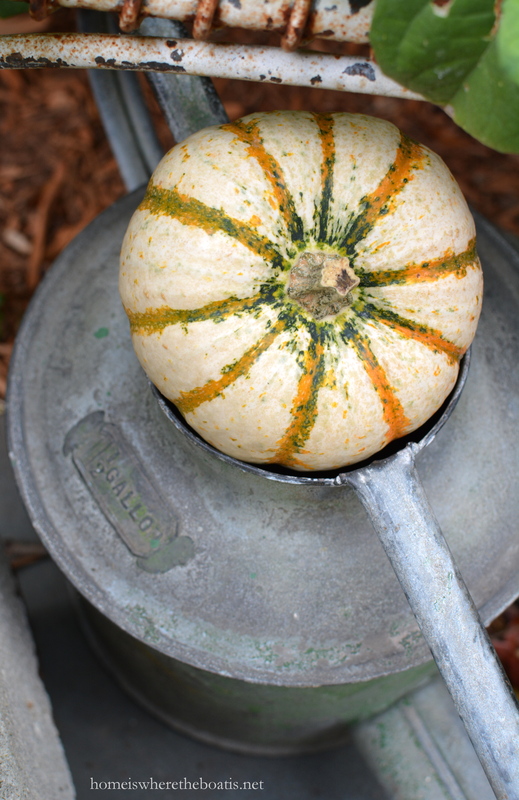 I love vintage watering cans! You have quite a collection. Your vine is amazing trailing all through your bench. 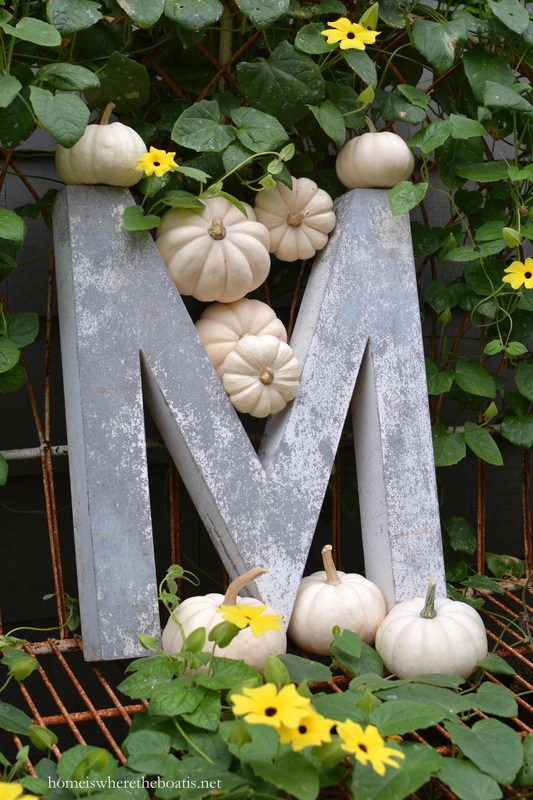 Great zinc “M” with all the cute white pumpkins. Your potting shed is always a delight. I’m all about the white pumpkin. And the Black-Eyed Susan vine is so much fun. I didn’t know they came in the vine variety! There’s a neighborhood near ours where most of the front gardens are “natural” but there are black-eyed Susans all over the neighborhood. I enjoy driving through and looking at them. Mary you make some of the most simple things look exciting and beautiful, its that touch of magic you have. Love your pictures. I too collect watering cans. Question. 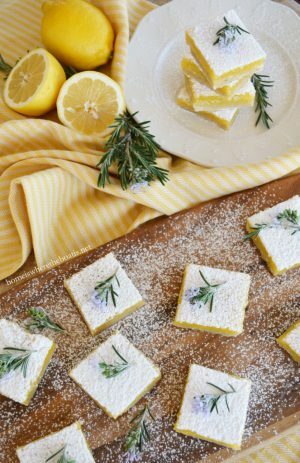 …how do you keep bees out of them? I am allergic to bees and they are always swarming around mine!! 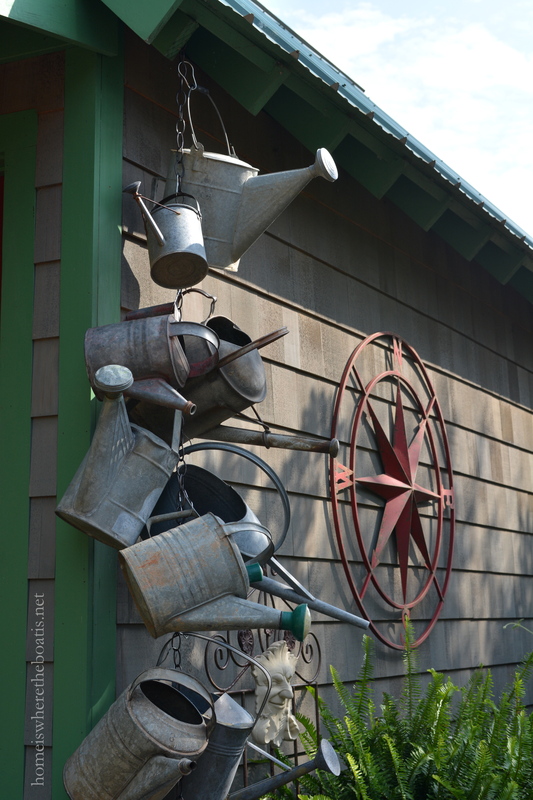 Love your water can collection and the way you have them displayed……off to get me some chain for my watering cans. Great idea!!!! I love the black eyed susan vines also. I also love the hummingbird vines. My hummingbird vine has gone crazy this year which I love. And your display of vintage watering cans is sheer perfection ! This is a stunning show of Black~eyed~Susan vine, dear one!!! I had not seen this before, but will definitely “look” for the seed next Spring!!! 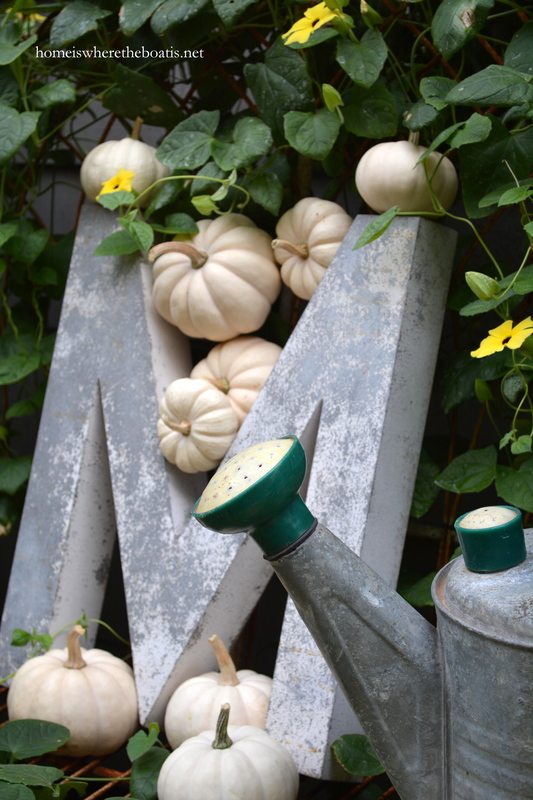 Love, LOVE, L O V E your collection of galvanized watering cans!!! Can one have too many watering cans??? I think, not!!! 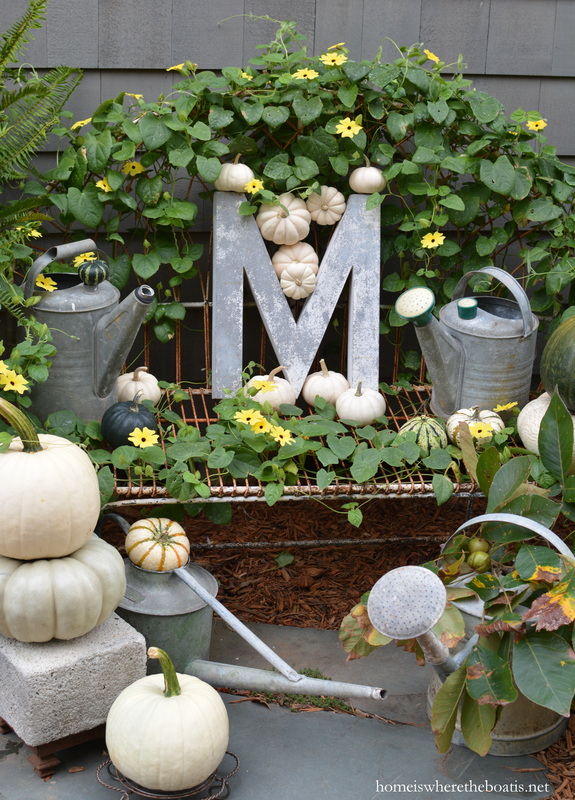 Thank you for sharing your lovely Garden Shed outer decor!!! Love love this idea! You have inspired me. Do you put a price limit on The watering cans you buy?